Escape rooms offer an exciting, unforgettable adventure for players of all ages. Plus, these challenges don’t require participants to have any experience with solving puzzles; an open mind and a positive, team-centric attitude are the only things needed to enjoy them! With that being said, it does help to familiarize yourself with some escape room basics before taking one on for the first time. For instance, you’ll want to know what to wear to an escape room in order to ensure that your outfit won’t interfere as you complete tasks and work your way to the room’s solution. Prioritize comfort – When it comes to what to wear to an escape room, we can’t stress enough how important it is to choose clothing and footwear that you’ll be comfortable moving around in. While escape rooms are primarily mental challenges, they still require some physical activity. For instance, you may find yourself bending down, reaching upwards or even crawling on the floor as you search for clues. With this in mind, it’s best to pick clothing that allows you to move freely and shoes that won’t hurt your feet or fall off as you race against the clock to crack the mystery at hand! Avoid anything that could potentially be distracting – Another expert piece of escape room advice is to stay away from clothing and accessories that may take your team members’ attention away from the game, such as brightly patterned shirts or bracelets that jingle when you move. And if you have long hair, it’s advisable to put it up in a ponytail or bun so that it doesn’t get in the way of you and others in your crew. Remember: your goal is to escape the room, not to make a fashion statement! Be ready to read and search – Escape rooms are filled with easy-to-miss clues and riddles, so if you rely on glasses to help you see things clearly, you’ll definitely want to bring them along. Otherwise, you won’t be able to collect and decode hints to the best of your ability! Knowing what to wear to an escape room and dressing accordingly is crucial to maximize your group’s chances of being victorious. For more secrets to success, check out our FAQs page and our tips to ensure an awesome escape escapade! Experience an Action-Packed Quest You Won’t Soon Forget at Expedition Escape! 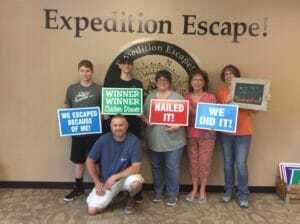 Now that you’re familiar with what to wear to an escape room and other best practices that will lead your team to a favorable outcome, you’re officially ready to visit Expedition Escape! To make a reservation for your group, simply use our online booking feature to select an open date and time for the room you’d like to try. If you’re looking for a challenge designed to suit beginners, we recommend trying The List at our Montgomeryville location, especially since it’s 30% off through July 29th when you use the code “JULY18” at checkout! If you’d like to celebrate Christmas in July with us and get this amazing deal, be sure to book right away before all the spots are taken! We can’t wait to take your crew on an adventure you’ll all be talking about for years to come!